Always fancied running your own burger joint? Dream no more! VR The Diner Duo will have you taking control of the head chef of a newly-opened fast food establishment. Can you keep your customers happy or will you be closing down on opening week? A fantastic experience for one or two players, VR The Diner Duo puts players in the shoes of a new fry-cook. Each day, customers will demand more and more from your burger restaurant, and it's up to you to keep them happy and fed. With one player making the burgers and the other serving tables, it'll take some real communication to ensure business is booming! With a range of levels that steadily increase in difficulty, VR The Diner Duo requires players to have a steady hand and a strong memory. Running a fast food service isn't easy, but with a head chef and a waiter working together, the restaurant relies on your communication skills to stay afloat. Not fancying the burger business today? The Diner Duo also offers a cupcake shop option for those with more of a sweet tooth! 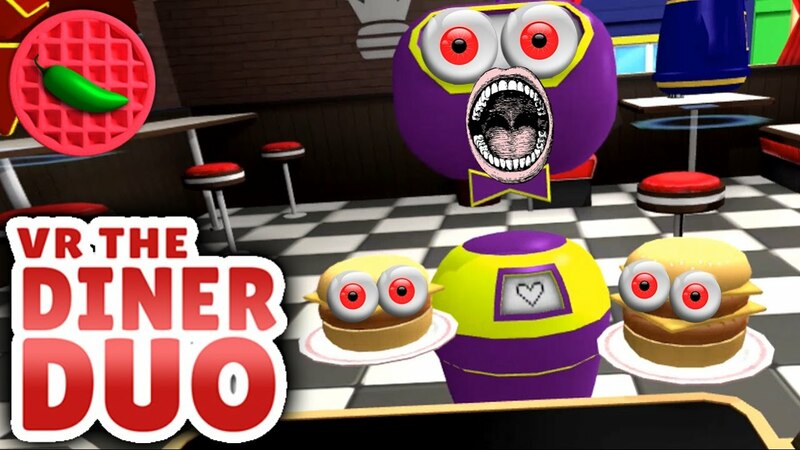 The first game Virtual Hideout offers that has two players working together, VR The Diner Duo takes place in a new burger restaurant and gives users the option of playing either as the cook or the waiter. As the cook, your job is to serve up exactly what the customers order, ensuring that each request is fulfilled quickly and perfectly. The waiter will support the chef, running drinks to tables and taking orders to pass to the player in the VR headset. Communication is key! Can you keep the business afloat?